One of four pairs in the regional pack, this is the East Side Air Jordan 1 Low. 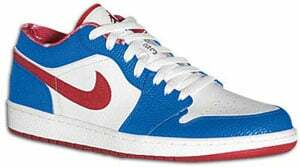 Released on May 26th 2007, the Air Jordan 1 East Side retro has a colorway of white, varsity red and varsity royal. Making them stand out from the rest. Retail price for the East Jordan 1 Low was $90.